A cotton suit is less formal, for sure, but if you’re attending an informal event during the day, a tailored cotton suit will make you look amazing. And why shouldn't your less formal suits fit as well as your business suits? With the summer closing in and the weather getting hotter, now is the perfect time to invest in something a bit different: a cotton suit. Besides being a perfect summer suit, a cotton suit is an extremely stylish way to nail the “smart casual” look. Paired with a T-shirt and some deck shoes or trainers, it’s perfect for a picnic or even a boat trip. 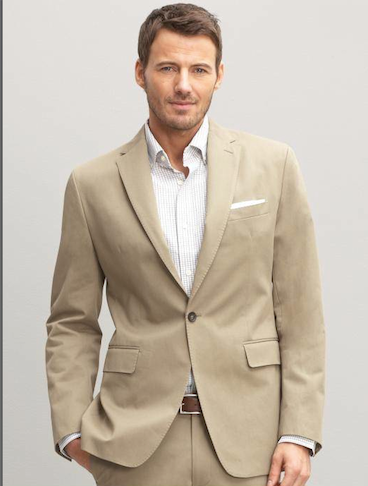 The best cotton summer suits are usually in a lighter shade like beige, cream or yellow. A Suit That fits has four cotton twill fabrics to choose from: grey, navy, black and beige. Want to wear a black suit in the summer without roasting? Commission one in black cotton! A man who has even his cotton suits tailored is clearly someone who takes his wardrobe seriously, both in terms of his formal and informal attire.